Tenement Museum Director of Programs Kathryn Lloyd will visit Darien Library on Wednesday, November 7 at 7 p.m. to discuss the museum’s work researching and sharing stories of individuals typically overlooked in history. The Darien Library is proud to cosponsor this event with the Jewish Historical Society of Fairfield County. Refreshments will be served. 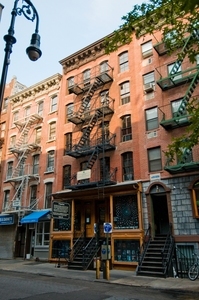 The Tenement Museum, located in Manhattan’s Lower East Side, tells the uniquely American stories of immigrants, migrants, and refugees in the ongoing creation of our nation. During this lecture, we’ll explore the stories of Natalie Gumpertz, a single mother and German-Jewish immigrant in the 1870s, Victoria Confino, a teenager from Kastoria whose Sephardic Jewish family fled war, and Bella Epstein, the daughter of Holocaust survivors who grew up in the changing Lower East Side of the 1950s. Discuss how the museum connects these stories from past to present, and how these stories help us understand the diversity of experiences in one building.